Aviator watch, stainless steel case, sapphire crystal, scratch resistant, diameter: 46 mm, 10 ATM (330 feet) water resistant and trigalight illumination. The Bücker aircraft were (and are also as present-day replicas) considered as having versatile, compact, reliable and first-class design. 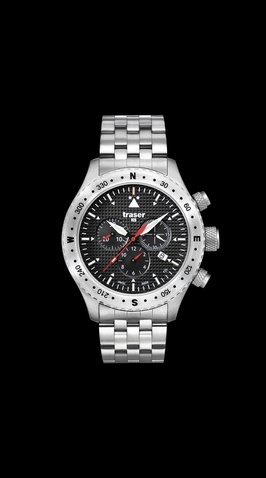 traser® H3 also took note of these features, and manufactured the new traser® H3 AVIATOR watches according to these criteria. Of course, every traser® H3 AVIATOR watch is fitted with the unique trigalight® technology manufactured by mb-microtec ag.